It’s getting spooky! 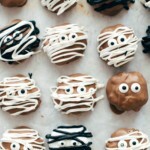 These Homemade Take 5 Halloween Mummies will rock your Halloween night. Just 7 ingredients and 15 minutes prep time. Boo, friends! Yap, it’s that time of the year again. Halloween is almost here. Are you as excited as me? I can say, that I LOVE Halloween. I envy every kid growing up in North America, where Halloween is a celebrated holiday for decades. When I was a child, Halloween wasn’t popular here in Europe. Bummer! But it doesn’t matter, I catch up on that and have been celebrating Halloween for years. Mario is the same Halloween freak like me. Lucky me! Eating tons of Halloween snacks and watching horror movies all night long. Can’t wait! You don’t want to spend Halloween in the kitchen, do you? Of course not! Me neither. This was the reason to come up with these Homemade Take 5 Halloween Mummies. 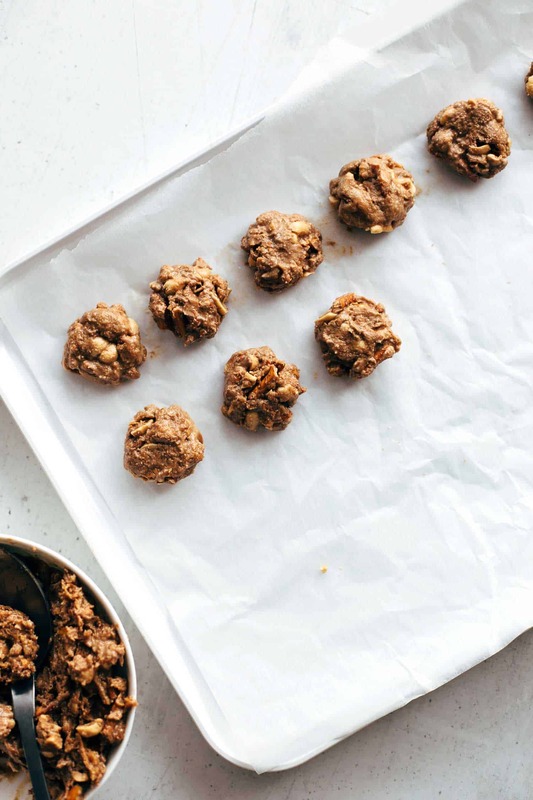 You don’t need to turn on the oven or need any fancy baking equipment. This Take 5 bars come together in a bowl by stirring with a spoon. Put them in the freezer for 10 minutes that they get firm. Meanwhile, melt the chocolate. 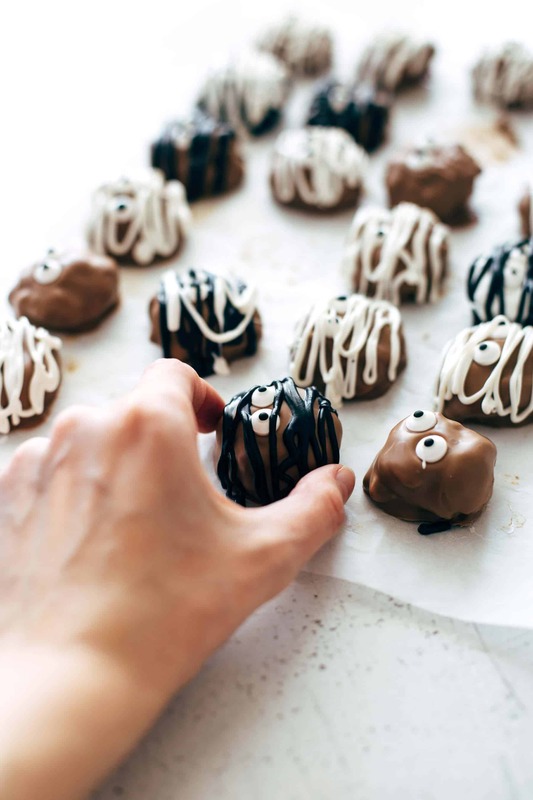 Then dip every bar in chocolate and place the sugar eyeballs on top. Put them back in the freezer for 5 minutes. Melt candy melts in the microwave and pipe lines on top of your Take 5 bars. When you put them in the freezer, you don’t need to wait that long in between the steps in comparison to the fridge. This Take 5 bars recipe comes very close to the Take 5 candy bars. It’s a copycat if you like. For this Take 5 bars recipe, you need the same 5 ingredients which are in the original ones. 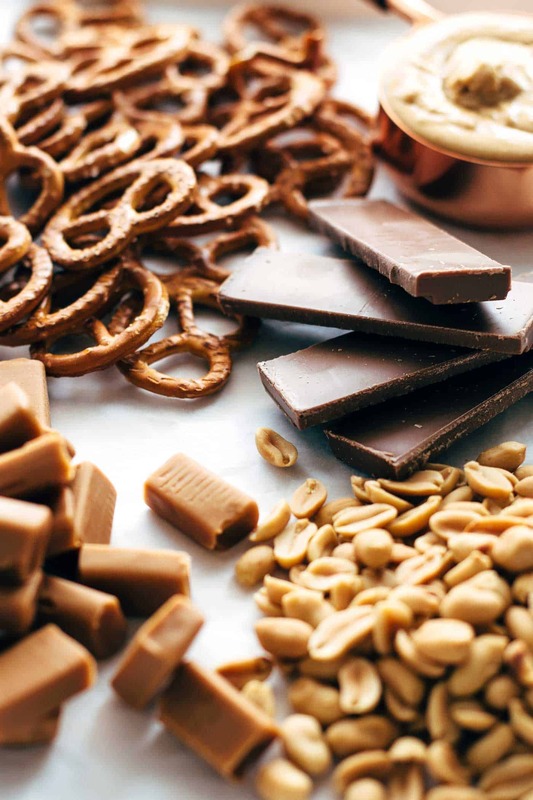 Pretzels, peanuts, peanut butter, caramels, chocolate. Candy melts and sugar eyeballs are for decorating. But if you don’t want to decorate them, skip that! Aren’t they adorable? And spooky? 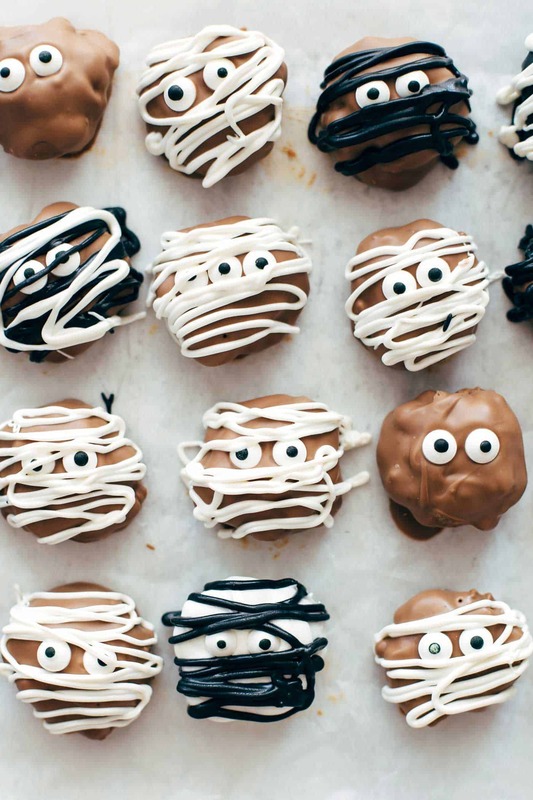 These little mummies are almost too cute to eat…..almost. 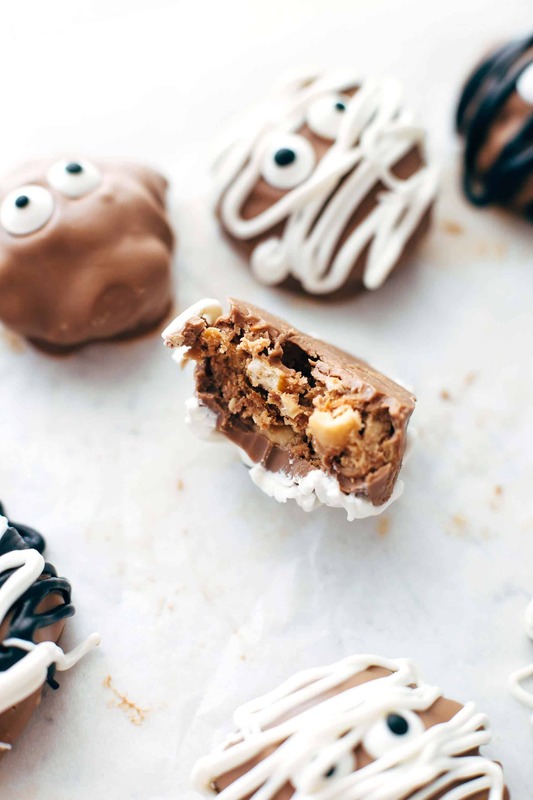 If you make this Homemade Take 5 Halloween Mummies recipe leave a comment, rate it and tag a photo #alsothecrumbsplease on Instagram! Would love to see your snap! It's getting spooky! 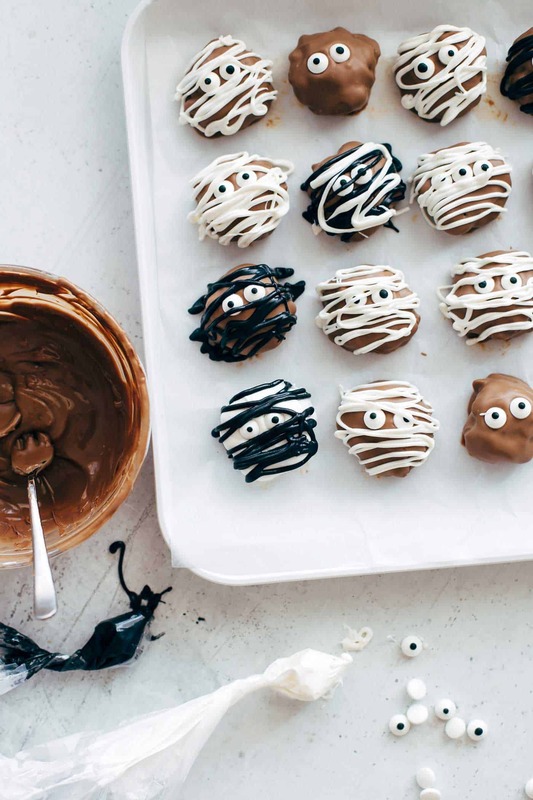 These homemade Take 5 Halloween Mummies will rock your Halloween night. Just 7 ingredients and 15 minutes prep time. Crush pretzels with your fingers roughly. If desired, chop peanuts roughly or let them in whole pieces. Place pretzels and peanuts in a large bowl. Set aside. Microwave caramels in a heatproof bowl for about 1 minute until completely melted. Stir every 20 seconds. Add melted caramel to the pretzels and peanuts. Do the same with the chocolate. Add peanut butter. Stir everything until well combined. Freeze for about 10 minutes that you can touch it easily without being too sticky. Then roll 24 flat balls out of it and put back in the freezer for about 10 minutes. Line a big flat plate with parchment paper and set aside. Melt the chocolate for the coating in the microwave. Remove the bars from the freezer. Dip every bar in chocolate until completely coated and place on the prepared plate. Place two sugar eyes on top of each bar and put back in the freezer for about 5 minutes to let the chocolate getting a bit firm. Meanwhile, melt the colored candy melts in the microwave according to the directions on the bag. Spread into a zip-lock bag and cut off a tiny little hole of about 0.05 inch at one edge. Pipe lines across the top of each bar. Let stand at room temperature and cool completely. Store in an airtight container at room temperature for up to 5 days. Mah – die sind wirklich sehr süß!! 🙂 Ich bin ehrlicherweise kein Halloween-Fan aber die sind wirklich süß für verschiedene Anlässe! Thank you, Catrin! I hope you enjoy Halloween a little bit more with those little cuties! These are just so dang HAPPY. I Love these little mummies! ich mag Halloween zwar so so gerne, jedoch ist mir diese typische Deko oft viel zu kitschig und schrill, so auch das Essen! Du hast hier aber Halloween Snacks kreiert, die mein visuelles Herz sowas von höher schlagen lassen! Und die Bilder sind mal wieder der Oberhammer! Jecky, thank you so much for your kind words! This means a lot to me! Hast wirklich einen tollen Blog – sehr hochwertige Fotos und auch die Videos haben eine super Qualität. Jürgen, your lovely words made my day! Thank you so much for stoppin’ by. Have a great Sunday!